Fig. 13 FRAKTUR MOTIF WEDDING QUILT BORDER BLOCK 1832 ATTRIBUTED TO EUPHEMIA KICHLINE (1819-1884), and Heinrich Ebner Taufschein, ca. 1830 Quilt courtesy of Metropolitan Museum of Art, NYC, 2016.432. Photo © and courtesy of Patricia Herr; Taufschein courtesy of Allentown Art Museum, gift of Mr. and Mrs. Arnold Kaplan, 2009, 2009.0060.030. Photo courtesy of AlyssumArts © DL Moyer. 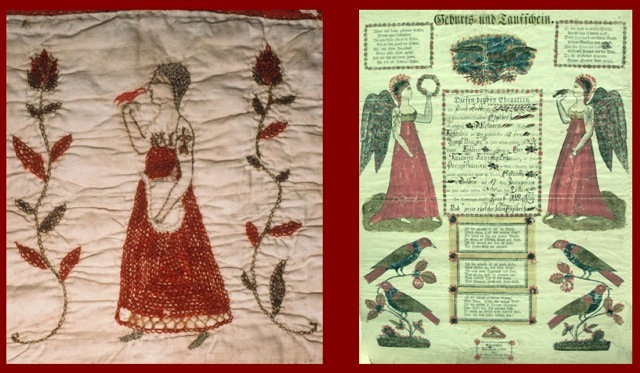 Published September 1, 2016 at 640 × 373 in Fraktur Quilts from the Schleifer-Kichlein Family.